Watchable, if occasionally predictable thriller heightened by strong performances and some offbeat location work, though the script has a few problems and isn't nearly as clever as it thinks it is. Contraband is a remake of Reykjavik-Rotterdam, an Icelandic thriller that director Baltasar Kormakur both produced and starred in. Mark Wahlberg plays Chris Farraday, a hotshot ex-smuggler-turned-family-man who's persuaded to undertake the time honoured “one last job” after his useless brother-in-law (Caleb Landry-Jones) gets deep into debt with psychotic gangster Briggs (Giovanni Ribisi). Assembling his old crew of smuggling types (including best friend Lukas Haas), Chris boards a ship headed for Panama and attempts to smuggle some counterfeit cash under the nose of no-nonsense ship's captain, Captain Camp (JK Simmons). Meanwhile, Chris leaves trusted friend Sebastian (Ben Foster) in charge of making sure nothing happens to his wife Kate (a blonde and almost unrecogniseable Kate Beckinsale) and their two kids, but things quickly go horribly wrong when it transpires that someone inside Chris' team is feeding information back to Briggs. 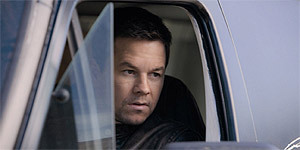 Wahlberg can do likeable working class hero types in his sleep, so he's more or less on auto-pilot here, with predictably solid, if slightly dull results. Fortunately, he's surrounded by a colourful supporting cast who liven things up a bit – Simmons is great value as the smuggler-hatin' Captain, while Ribisi gives it the full-on twitchy psycho routine as Briggs and Diego Luna is good value as Chris' Panama contact with a lucrative sideline in stolen paintings. Beckinsale is equally good as Kate (and is clearly relishing the chance to ditch her usual posh persona), but she's pretty much sidelined by the script and doesn't get all that much to do. Kormakur keeps things ticking along at a decent rate and there are a number of enjoyable sequences and shoot-outs, most notably during the Panama sequence. Similarly, the film benefits from some offbeat location work (the Panama Canal), which is heightened by cinematographer Barry Ackroyd's moody photography. The main problem with the script is that it thinks it's being terribly clever, whereas in fact, any film-savvy audience members are likely to be two steps ahead at all times; you can probably guess the double-crosser from the cast list, for example, while the (admittedly satisfying) finale plays out almost exactly the way you expect. There are also a few annoying logistical issues (such as the various timings involved in the smuggling operation) and the film has a tendency to establish characters and then leave them with nothing interesting to do (Haas, Luna, Beckinsale). Contraband is a solid, if forgettable Friday night thriller enlivened by a decent cast and some offbeat location work, but it's also a little too clichéd and predictable for its own good.